Kelowna, British Columbia poet and editor Jake Kennedy’s third poetry collection is the absurdist and sincerely earnest Merz Structure No. 2 Burnt by Children at Play (Toronto ON: BookThug, 2015). Following The Lateral (Montreal QC: Snare Books, 2010) and Apollinaire’s Speech to the War Medic (BookThug, 2011), this new book concerns itself with discovery and being lost, and how one can only truly be achieved through the other, composing a series of striking poems deliberately meant to occasionally unsettle, forcing a deeper attention of his incredibly sharp and precise poems that shift from meditation to improvisation, and tight lyric to prose poems, and even include a sequence of poems composed as billboard-style single sentences. Kennedy’s poems delight in the mix of classical reference, meditative lyric and mischievous speech, tossing in the occasional line or phrase of casual diction, or a pop reference that at first might seem entirely out of place. Kennedy revels in the play between the two—high and low culture, high and low speech—and shows the possibilities of what poetry can become through the blending of worlds too commonly kept apart in contemporary poetry (think also of David McGimpsey’s self-titled “chubby sonnets”). Much like his previous collection, Apollinaire’s Speech to the War Medic, Merz Structure No. 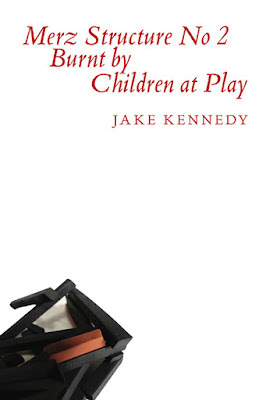 2 Burnt by Children at Play, Kennedy concerns himself with history, citing a variety of historical figures and their works including Camille Claudel, René Char, Cezanne, Stan Brakhage and even Harold Ramis, as though, through them, working through his own sense of the contemporary. As he writes in “A Brief History of the Cemeteries of Huron County, Ontario”: “for those who do or no not / reach into their past like darkened rooms[. ]” His poems move from elegy to lyric fragment, exploring a looseness (in comparison to McGimpsey, certainly) that allows his poems a particular quality of lightness, and a cadence of sound and collision that nearly make one want to read each piece aloud. To be all, especially a body. Look, a a well has coherence but no singleness of focus; nothing within it (you) is irrelevant. The body as array; you have a wish to make a thread fused to another: ordering them, you give the way you want, while the other, ordinary body deals with its singleness by focusing attention on time. In other words, you lose the “logically”—you look to unity to be irrelevant digressions and unnecessary shifts in points of view: “you” as rearranging body: your disrupted singleness: a wish in a well.